And by 'it', I mean 'me'. Nice little ride this morning, up one of my favourite short, steep climbs in the area - it looked like it might rain so this was the obvious choice of early morning route. Especially interesting, though, was what I was wearing on my wrist - a Polar RC3GPS watch - or perhaps more acurately, what I was wearing around my chest: a Polar Heart Rate Monitor (HRM) strap. I have the unit on 'loan' to test, although I'm hoping I get to keep it. As it stands, I am seriously impressed. 1) It has GPS, so I am no longer a slave to my iPhone's battery when I want to record my rides (and it's far more accurate). 2) I've never used HRM before, but being able to see your heart rate and which zone you are in, in real time, makes you more aware of how much you're pushing and how sustainable that is. 3) You can get all kinds of amazing details out of it after a ride, of which I am sure I'm just scratching the surface. 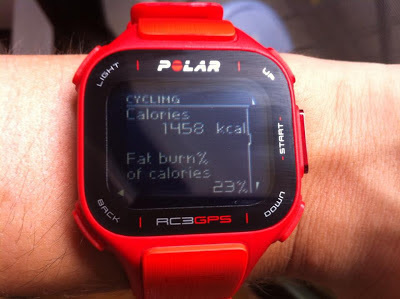 4) Unlike a Garmin bike computer (I've been looking at the Edge 500 recently), it works both for cycling and other activities (running, hiking, etc). I'm looking forward to taking it on hikes, without the HRM strap. 5) It really is exceptionally orange. Polar's data export system is a bit wonky so you have to merge two files (.gpx and .hrm) together before you can upload to Strava, but that's a minor hiccup. It's a very impressive bit of kit, being no larger than a regular digital watch. I wasn't kidding about the 'orange' thing. Altitude (grey) and heart rate (red) data, plus zone analysis, for this morning's ride. There are some big rides coming up and I'm hoping that using this I can start training more efficiently within specific HR zones, which should give me a big improvement in riding fitness. Time will tell!